* I Love New York For Marriage Equality starts off with sweet fruits – plum and tangerine with a hint of spice (clove and allspice) and a slight touch of sandalwood. 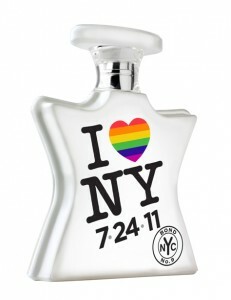 * The date on the bottle, 7-24-11, is the date that the Marriage Equality Act took effect in New York. * The fruits start to fade as the florals come in. The florals are not overwhelmingly feminine – a guy could easily pull this off, a dry rose with a mix of muted white florals. * The transition of this fragrance is subtle but well-defined. You can definitely sense the top, middle, and base notes. * Sandalwood becomes the main focus in the dry down surrounded by sweet amber and vanilla. It may sound odd, but there is something slightly sweaty in the base which balances it and keeps it from getting too sweet and creamy. Summary: A rainbow heart on the bottle for LGBT rights screams co-opting, doesn’t it? Fruits and florals are SO gay, right? The “I Love New York” series started off with a “For Men,” “For Women” and “For All” trio, so I laughingly referred to this as the “For Gays.” The funny thing is if you put this juice in a regular designer bottle, it would fly off the shelf as a mainstream monster. It is sweet, but not too sweet, with a strong sandalwood throughout the development, so guys and girls can both wear this easily. The longevity is really good, lasting twelve hours and it’s definitely office-friendly (though the bottle might not be). This scent is quite amazing, and I fell in love with it the first time I smelled it at the Elements Showcase back in January – and I’ve been bugging my local Bond stockist for six months waiting for it to arrive. Although, I don’t know if Bond is donating any of the proceeds from sales to the movement, I give them props for boldly putting the rainbow on the bottle. Together with For All, Marriage Equality are two of the strongest fragrance releases from Bond No 9. Ok – I told myself that I wouldn’t resort to obnoxious gay humor on this blog but this scent literally starts with fruits, goes to flowers, and ends with wood. It definitely sounds like a first date to me. Sorry, I couldn’t help myself – it’s just too obvious. No disclaimer needed as I own a full bottle. Image courtesy of Bond No 9 Website. Teehee. “literally starts with fruits, goes to flowers, and ends with wood. It definitely sounds like a first date to me.” This was the best part! I mean, I enjoyed the review part too, but still. I sniffed this from the cap in the store, and decided it wasn’t for me, but enjoyed your take on it.